It’s no secret that when it comes to augmented reality (AR) and virtual reality (VR), I’m swayed more towards AR and “mixed reality” (MR) as potentially being the “thing” of the future. Not, as I’ve often said, that I don’t believe in VR – it will in time grow to fill various niches and requirements. Rather, I just feel that AR / MR have a much wider field of application when it comes to impacting our daily lives. I mention this because earlier in June I read an interesting piece by Dean Takahashi, examining Qualcomm’s emerging role in what they like to call “XR” – or “eXtended Reality”, which they define as a fusion of VR, AR and MR.
Qualcomm spells out the hurdles to ‘extended reality’ glasses offers a transcript from a chat Dean had with Tim Leland, Qualcomm’s vice president of product management, on the company’s goal and the challenges they see in bringing headset-style devices to the market. Qualcomm, of course, is the company behind the veritable Snapdragon family of processors. In 2016, they announced their intention to make the Snapdragon 835 chipset the heart of a new range of self-contained VR and AR devices. To that end, they are about to start shipping the Snapdragon 835 VR HMD to OEMs wishing to produce Android-powered VR headsets using the chipset and Google Daydream. More particularly – from my perspective – Qualcomm has already partnered with Osterhout Design Group (ODG), to develop a range of Snapdragon-powered AR headsets. I first became aware of the first of these units, the R7, in mid-2016. 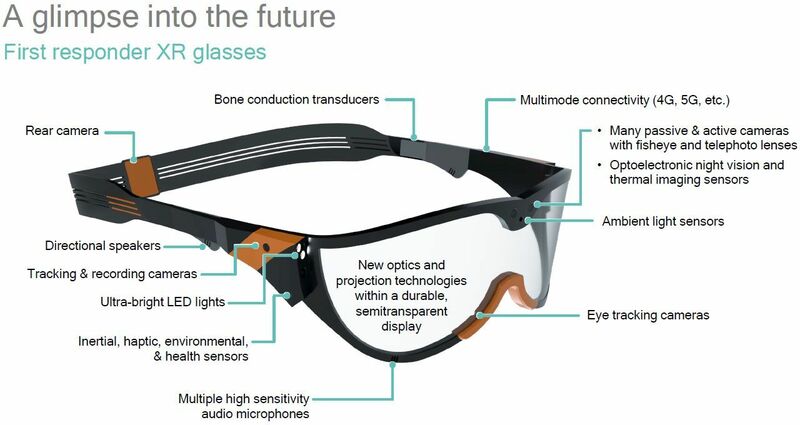 Intended to be a heads-up AR system for enterprise solutions (selling at US $2,750), it has gained a degree of traction in a number of fields – hazardous environments (oil exploration and production, chemical production and pharmaceuticals, healthcare and surgery), and has been involved in tests helping the visually impaired. In 2017, ODG are due to release two more units – the “prosumer” R8 (around US $1,500) and the “consumer R9 (at “sub-$1,000”). Again, these are Snapdragon 835 based, and will be fully self-contained units with Android and their operating system. It is the self-contained aspect of such headsets which Qualcomm sees as being one of the keys to the future success of “XR”. Qualcomm see “XR” systems potentially becoming a mainstay of our daily lives, fusing VR and AR into a single headset unit which can meet a variety of needs at any given time, and which can also be used as the basis for specific use-cases. In this Qualcomm see XR units being both general purpose and specific to market sectors. The company is already looking at a concept for a “first responder” headset for fire fighters. 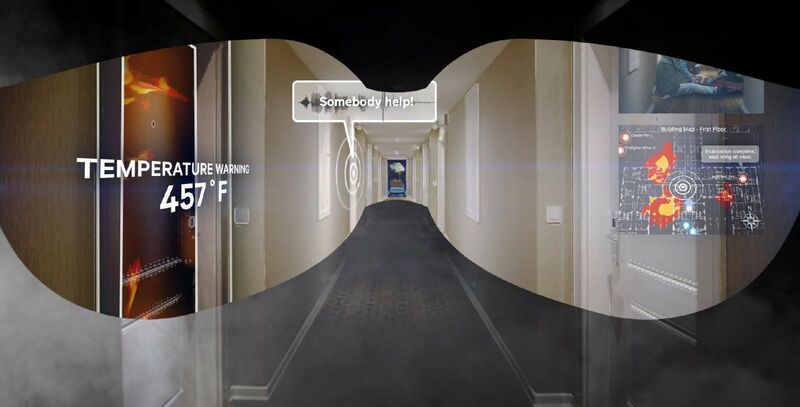 Containing night vision capabilities and thermal imaging sensors, the headset could allow fire fighters overlay their field-of-view with floor plans of the building they are in, helping them find their way through the smoke, while the thermal sensors warn of potential hotspots and possible behind-the-door risks of backdraft – and could even guide them to people trapped in a burning location. For more general use, Qualcomm are looking at headsets which integrate much of what they’ve developed with the likes of ODG – multiple cameras, integral motion tracking, the ability to track eye and hand movements, etc., but in a very lightweight, unobtrusive form-factor with a low price point which makes them an attractive proposition. Not that this is going to happen overnight. A refreshing aspect of Qualcomm’s view is that they are looking at a development / adoption curve measured in at least a decade. As Leyland notes, the ability to have AR and VR heads headsets exists today, but there are hurdles to be overcome before they are as ubiquitous as the mobile phone for many of the tasks we perform today. Some of these hurdles are being independently addressed – 5G, for example, is expected to be of huge benefit to those uses which require a lot of rendering and so are latency intolerant. Others are going to take time to progress and solve: display requirements – the vergence and accommodation conflict, human field of view (190ox130o) etc; common illumination); motion and tracking for intuitive head, hand and eye movements; and power and thermal issues. Leyland doesn’t see any of these hurdles as being problematic – he just emphases that the time frame required to solve them is not going to be as compressed as some of the more bullish predictions about VR growth made in 2016 would have us believe. Instead, he points to 2020 as still being a year when numbers of shipped headset units of all types is still measured in the hundreds of millions, although he does see it growing from there. But will these systems ever reach the ubiquitousness of the smartphone? 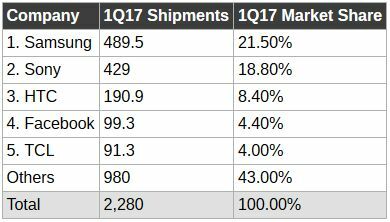 Right now, going on the shipments of VR headsets some are quick to pooh-pooh the entire mixed reality (or XR if Qualcomm prefer) ecosystem in favour of alternatives. On the surface, they would seem to be right – but on a longer-term look? I’m not so sure. Again, this is where the much-hyped smartphone analogy with VR is misleading – as Leyland points out in talking to Takahashi. While it is true the first “genuine” smartphone as we know them today only appeared a decade ago, the fact remains that it was founded on some three decades of cellular phone development. right now, headset capabilities are roughly in the “1990s” phase of that overall curve – so there is a way to go. As such, while headsets that more closely resemble glasses / sunglasses may not necessarily become as all-pervasive as smartphones are today, there is little reason to doubt they could – if they have an intuitive ease of use – take over from handsets (and associated wearables) for a wide variety of tasks / uses. Qualcomm isn’t alone in pursuing a convergent future of mobile VR / AR / MR capabilities. However, through Dean Takahashi’s article (and courtesy of Qualcomm’s Augmented World Expo presentation, it is good to see how level-headed is the approach being taken be tech companies to both understand the technology , its potential and to look beyond the buzz phrases like “killer app” or order to make “XR” work. Next Post Space Sunday: more Einstein, plus space planes and Wow!